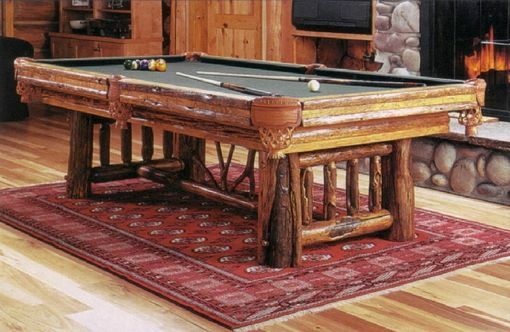 This variation of the Madison pool table has horizontal beetle-tracked pine and pole aprons and is stained with a Pure American finish. 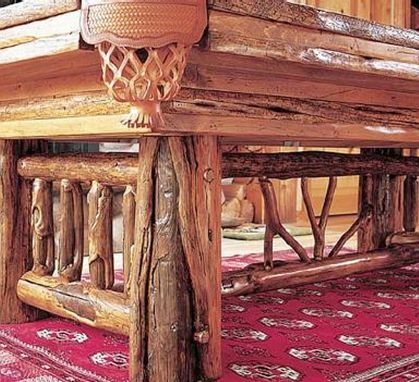 The Wilderness Madison contains three natural "Y's" that are elegantly hand-scribed into the trestle in the base of the table. A close-up of the Wilderness Madison reveals the unique distressed pine and log body supported by a hand-scribed, spruce-branch trestle base.